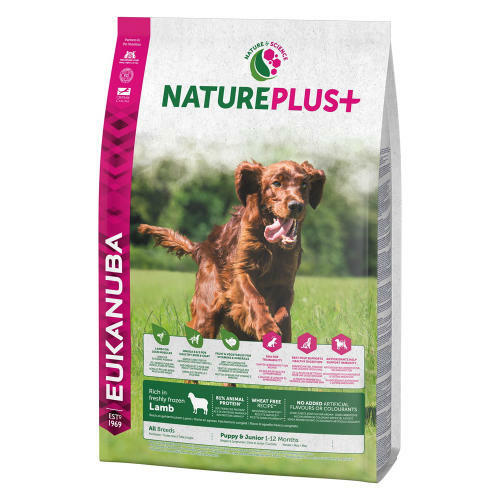 Eukanuba Nature Plus Lamb Puppy Junior Food is made with natural ingredients compiled into a unique recipe designed to support your puppy’s development. It contains a high content of freshly frozen New Zealand lamb, as well as chicken and turkey. This wheat-free dry food provides your growing dog with sufficient energy and animal protein to ensure strong, lean muscles are built. A mix of fruits and vegetables is included in the recipe to offer a naturally high content of valuable vitamins, minerals and fibre. Freshly frozen lamb (16%), dried chicken and turkey, rice (16%), millet (14%), sea fish meal, poultry fat, pea meal, potato meal, sugar beet pulp meal (3.2%), poultry broth, minerals, brewer’s yeast, maize oil, dried apple slices (0.5%), dried carrots (0.5%), dried green peas (0.4%), fructooligosaccharide (0.28%), dried spinach (0.2%), dried tomato (0.2%), linseeds.